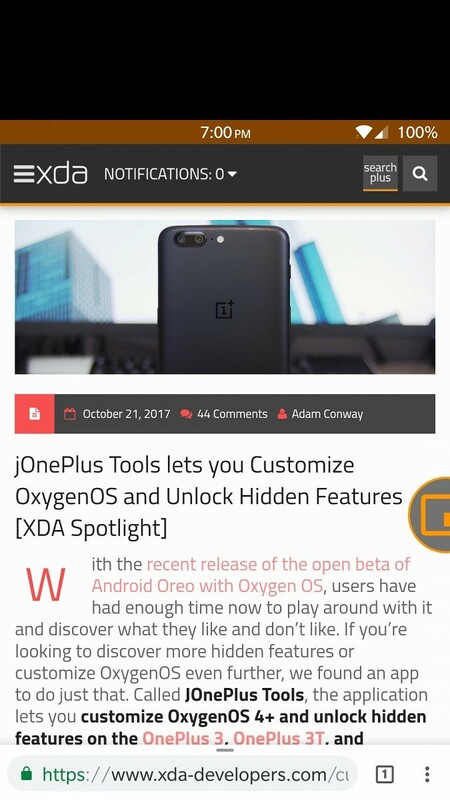 One Handed Mode by XDA Brings Apple’s Reachability Feature to Any Android Phone! As more and more smartphones with larger displays are released, consumers are finding it difficult to use their smartphones with one hand. While most basic actions such as taps and scrolls can be done with one hand, reaching for the top of the display to pull down the status bar or tap on an app’s toolbar can prove difficult. Some smartphone manufacturers like Apple, Samsung, Xiaomi, Huawei, and LG get around this by offering a special one handed mode feature. Not every smartphone has such a feature, like the tall Google Pixel 2 XL. 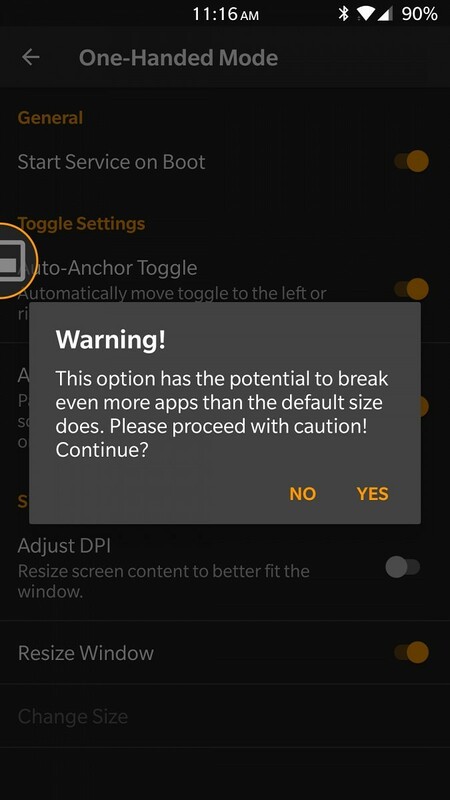 That’s why we’ve been working on an app that brings this feature to any unrooted phone. Introducing One Handed Mode by XDA. 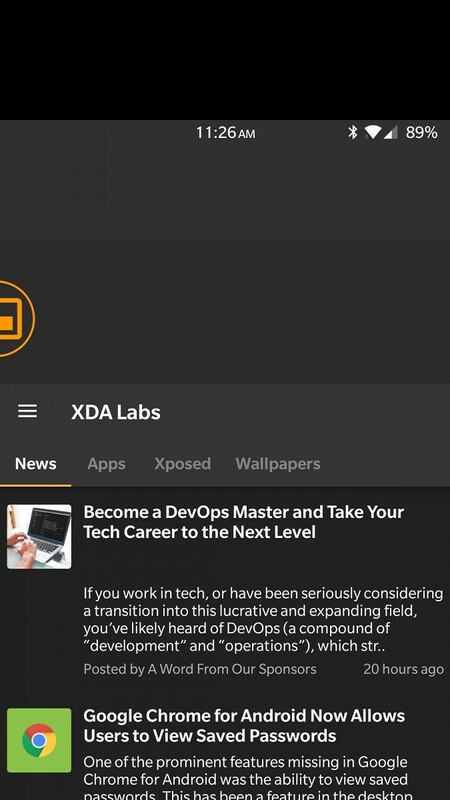 This app is a nifty tool to help you reach the top buttons of any app or the status bar. 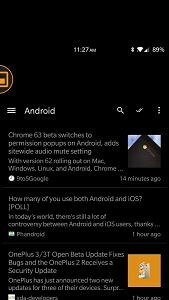 A floating bubble (inspired by ParanoidAndroid’s Halo) follows you on screen to let you toggle One Handed Mode wherever you want. Just tap the button and your device’s screen contents will shift downwards to make everything easier to reach with one hand! 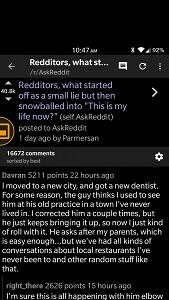 The bubble can be moved around by long-pressing on it and can be dismissed if you decide you don’t want it showing up on screen anymore. Best part? It doesn’t require root. This is the only application on the Google Play Store that allows you to do this. Every other option out there requires a rooted device with or without the Xposed Framework installed. But not ours. The app is fairly simple, so we didn’t want to bog down users with tons of unnecessary options. On the app’s main screen, you have the option to “Enable Toggle Overlay” which is what starts the floating bubble seen in the screenshots above. 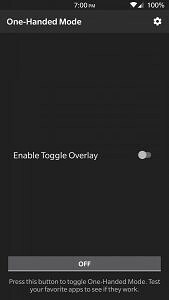 Enabling the toggle overlay requires that you purchase the full version of the app through an in-app purchase, which we’ll get to in more detail below. 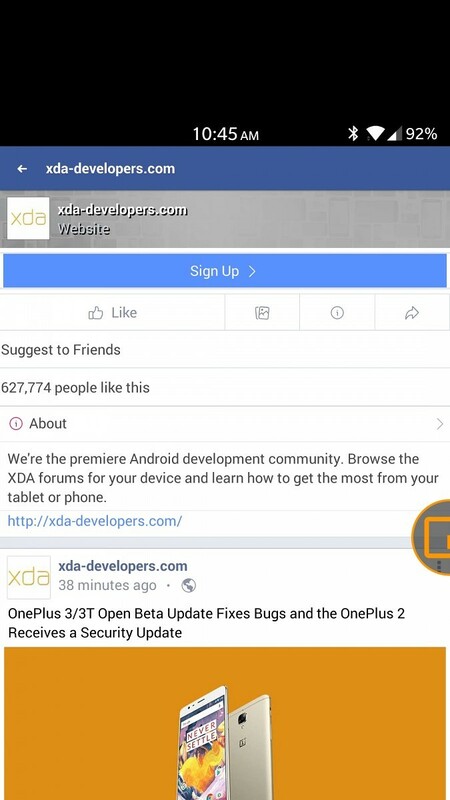 At the bottom is a simple button to try out what your device will look like in one handed mode—perfect for those who want to see what the app is like before buying the full version. When you tap on the settings cog to open the settings page, you’ll see a few options here. 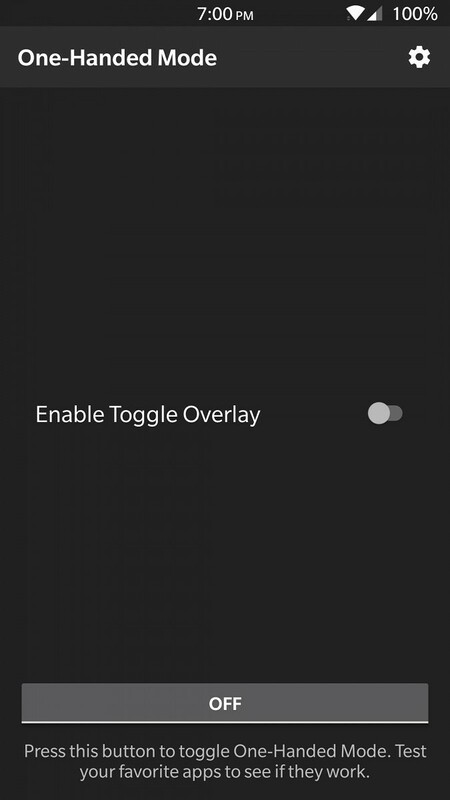 You can choose to enable the toggle to show up on boot, whether or not to automatically anchor/partially hide the toggle to a side of the screen, or resize the one handed mode window. 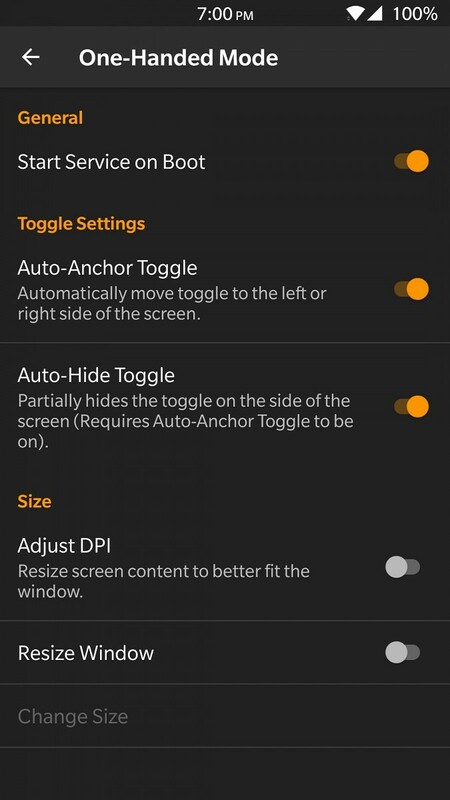 The Toggle Settings are all enabled by default. On the other hand, the size settings are all considered experimental. By default they are all off. The Auto-Anchor and Auto-Hide Toggle refer to the floating bubble. Auto-Anchor will cause the bubble to quickly pivot to the left or right side of the screen if you let go of the bubble while moving it around. Auto-Hide toggle will make the bubble hide halfway outside of the screen so it takes up less space. You can turn these options off if you find yourself constantly moving the bubble around. 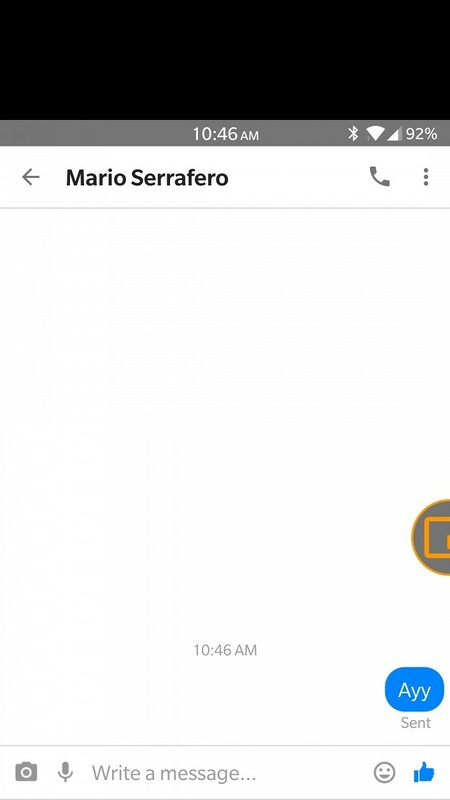 Adjust DPI resizes the screen’s content to better match the one handed mode window. It can allow you to fit more content on the screen by making text smaller, for instance. As you can see in the screenshots above, more content is visible when the adjust DPI option is turned on. But that comes at a trade-off because enabling adjust DPI requires the screen content to be refreshed, thus it is slower leaving it enabled. 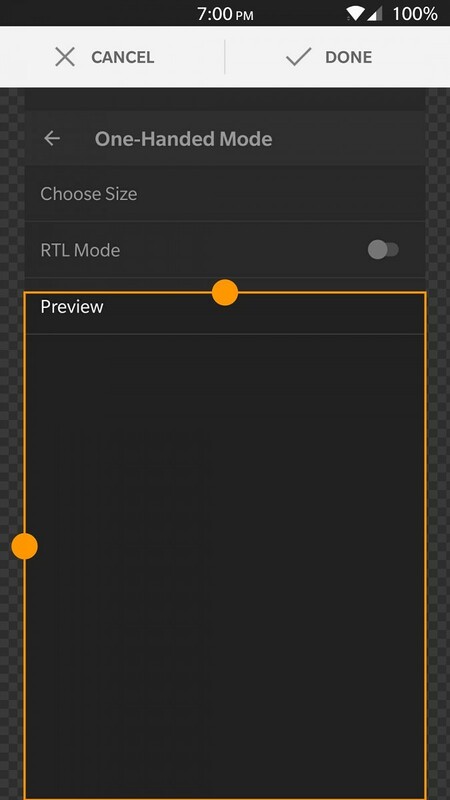 Disabled by default, we provide users the option to resize the one handed mode window. This will allow you to not only move screen contents downwards but also shift them to the left or right. We do not recommend that users enable this feature because it has the potential to break some apps—more on that down below. 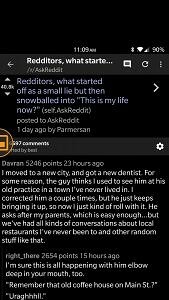 If you do choose to resize the window, you are greeted with an interactive box you can resize which represents how large the one handed mode window should be. 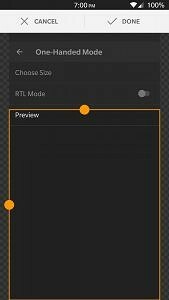 By default the box can be moved towards the right but if you toggle “RTL Mode” the box can be moved to the left as well. 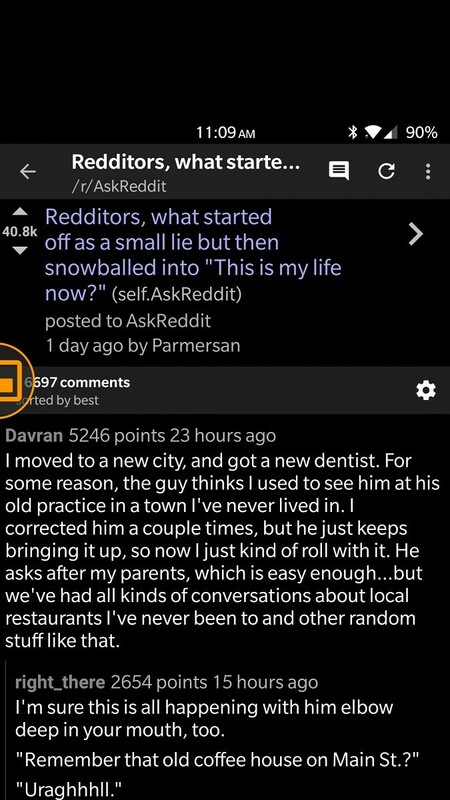 Tapping the “preview” button will cause the screen enter one handed mode temporarily with the size you chose. What’s this about some apps not working correctly? Unfortunately, not every application will handle being placed in one handed mode appropriately. We have a theory as to why and a potential workaround to force any app to work nicely, but implementing it will be complex. We wanted to gauge how much interest there would be in the app before we decide to commit to developing this workaround. Nonetheless, here are a few screenshots showing how certain apps can behave in one handed mode. 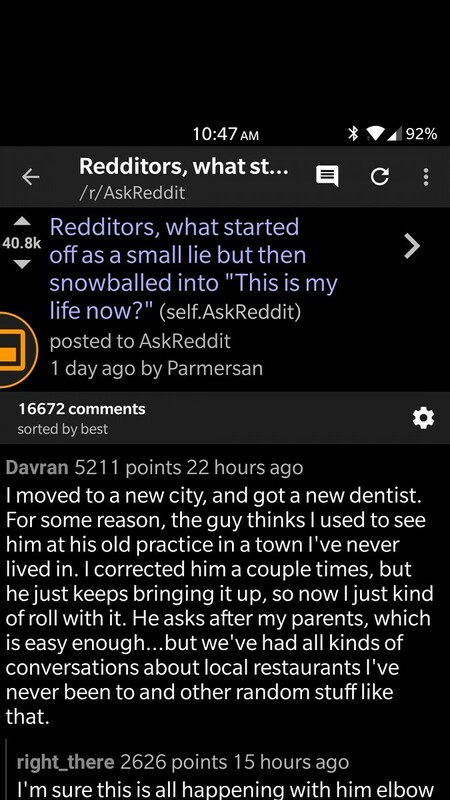 Clearly, there’s a gap between the top of the actual app and the status bar. It doesn’t make the app unusable, but it’s certainly something to be aware of. That’s why we provide users the ability to test One Handed Mode on their favorite apps before purchasing the full version. That’s also why we highly recommend that users don’t resize the window—the gap becomes even more pronounced and apps can look even funkier if you mess with the size too much. But we left the resizing feature in case some users wanted to have that ability. But we can also confirm that it works on a myriad of other devices. We didn’t test this application on many devices that already have a built-in one handed mode feature, because there’s really no point. 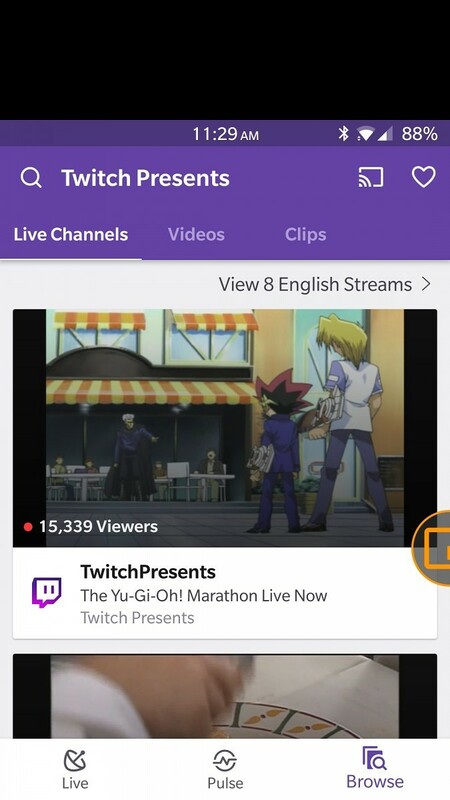 This app is for those devices that don’t have a feature like this already. The application is available starting today on the Google Play Store. The app is free to download, setup, and test in your favorite apps. However if you want to enable the floating bubble or change any of the settings, you will have to purchase the full version of the app through an in-app purchase. For the first week, that purchase will cost you $0.99. After one week, we will raise the price to $1.99. We feel that this is a fair price considering the utility of the app on taller smartphones and the fact that this is the only app on the Play Store that does this. 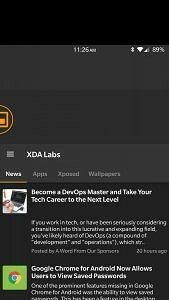 I personally came up with the idea and implementation details myself, then personally reached out to XDA Forum Moderator Zacharee1 to have this app developed under the XDA brand. We have 50 promo codes to giveaway for this app! Just leave a comment below with a link to your XDA Forum Profile and check your private messages for a promo code! We will hand them out randomly! All 50 promo codes have been given out. Thanks to everyone who showed interest in the app! We will have more giveaways in the future as we hit more milestones in the app’s development! Once you’ve installed the application, it will walk you through the process to set it up. It requires the use of ADB to grant it a certain permission. We have a written tutorial on how to set it up as well as a video walk-through by TK linked below. Where do I leave feedback? 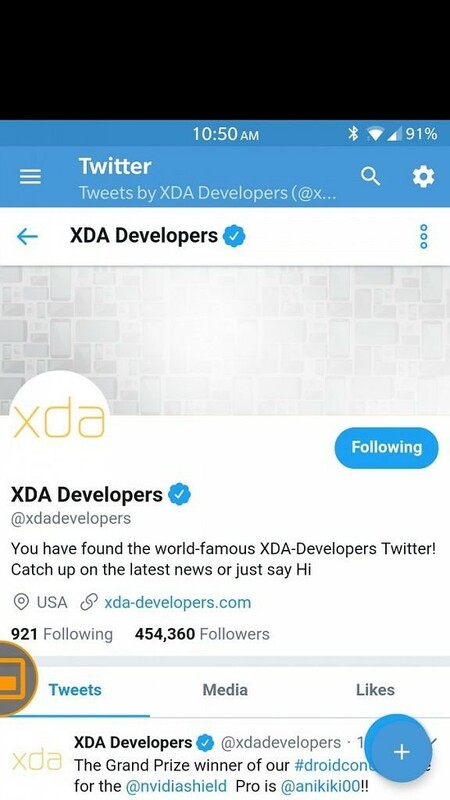 If you have any questions, concerns, or feedback, please reach out to us at [email protected] Check out our accompanying forum thread if you want to leave feedback on XDA.